Kite 2012 is a site mainly focused on kitesurfing. However, in rare occasions surfing or wake boarding videos are published on the net that are so great that they deserve some space here on Kite 2012. This surfing video is one of those rare occasions. John Eaves has filmed a giant swell rolling in over Cloud Break in Fiji. This swell apperantly created some sick waves! The guys in the water must have had the most epic surfing session in there whole life! Cloud Break, fiji, june 8th, 2012 during the Volcom ASP surfing event a giant swell rolled in from the south. the contest was running all morning until the waves got so big, the contest organizers called it off for safety reasons, a call that will be forever debated in the surfing world. Regardless, it opened the doors for anyone willing to go for it, and there were many big wave riders that had flown in on news of the swell. the afternoon provided us with non-stop entertainment. I have been a fan of surfing ever since I saw Simon Anderson introduce the Thruster at Pipeline in the early 80’s. I had a ring side seat and just happened to pack my Canon 5D in the bag that day! It will go down in my memory as the best surfing I have ever seen. Cape Verde is quickly becoming synonymous with the term Kite Surfing. It is a hidden jewel in the middle of a vast ocean. 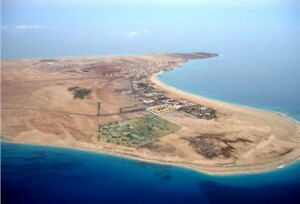 Having lived on the island of Sal for 6 years I can confidently attest to its greatness as a kite destination. Where else in the world can you arrive at an airport and travel only 20 min to your hotel and then only another 10 min to one of 4 kite spots. Not many by my reckoning. I learned to kite surf here and will freely admit that it was challenging. There is no lagoon, no shallow water and nowhere that is always completely flat. However, by the time I was up and riding I felt confident that I could kite surf anywhere in the world. Once I was up, I worried that I would soon become bored and have to find a new challenge. However 6 years down the road, the opportunities for challenge are boundless. Sal has 4 main kite locations all within a 10-20 min range. Each spot offers something completely different. There is the Bay Santa Maria. Here the wind is often side off (though it can change to off, on, or side) and fairly flat. It is a great place for long runs. There are no rocks, no reefs, but you may bump into a turtle, some dolphins and on occasion even a whale. Further up the Bay is Lembje beach. To enter here is a little difficult as there are some rocks. However once you are out, it is great sailing. The inside of the Bay is flat, whereas the outside often offers a lovely swell. When the waves do come in here, they are some of the nicest on the island. On the west coast there is the beach in front of the Riu hotel. Here the wind is more off shore and is brilliant for speed sailing and free style. It is also 500 meters from the world famous wave spot Punta Preta. Punta Preta, when it is working, offers an orchestra of both large and powerful waves. The wave can reach up to 6 meters high, with a beach break to match. Across the island from this spot on the east coast is Kite Beach. Kite beach has a reef, on shore winds, and waves for those yearning to jump and play in waves without fear. To top it all off, we have yet to reach the point of saturation. There is space to play, space to ride, space to jump. When you are not on the water, the Island is governed by the local motto of NO STRESS. Cape Verdians are friendly and easy to spend time with. There is little to no rain and there is more than enough sun to satisfy those accompanying the obsessed kiter. There are no major tourist sites, which makes for a stress-guilt free holiday of either lying in the sun or being out on the water. There are a number of schools on the island offering lessons and rentals for both kite and windsurfing. I would recommend Surf Zone, which has a school in the Bay of Santa Maria and on the west coast in front of the Riu hotel. It is the only school that offers only private and semi private lessons to ensure both safety and quality lessons. 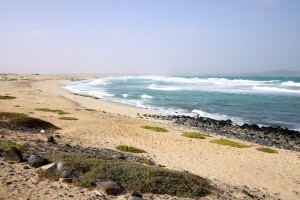 For more information on the island, kite spots etc, visit their site www.surfcaboverde.com , which offers a large amount of information. For me, having traveled and lived in a number of countries, this is as good as it gets. These girls might not be the most skilled kitesurfers, but very nice to watch! In fact I like this little video better than all the cool guys showing off their crazy unhooked freestyle trick. The competition among kite manufacturers is becoming stronger and stronger. Cabrinha is still the biggest of them all, but they are forced to push their marketing to another level. A new weapon is their team rider Alby Rondina, here teaching us how to make a perfect back mobe and of course riding with Cabrinhas new Drifter and Nomad.